﻿John Graves’ writings about rivers and Texas’ other natural resources live on beyond his passing. ﻿There’s something intangible about the river that flows in most people’s souls, rising in the prolific spring of the mind, coursing through the veins of our experiences and pooling in our hearts. ﻿ Not surprisingly — given that the ancient bond between man and river formed the very nexus of civilization — some of the world’s greatest books have to do with rivers. 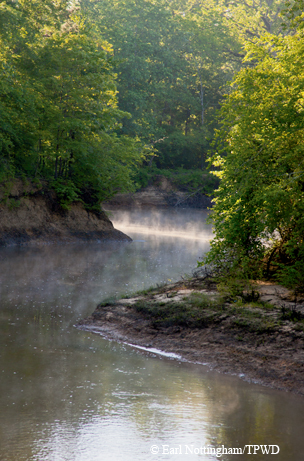 Mark Twain made the Mississippi a character in his classic novel The Adventures of Huckleberry Finn. Joseph Conrad used a river in Heart of Darkness, and James Dickey did it in Deliverance. But those were all works of fiction. The late Texas writer John Graves, who died in his sleep at his Hard Scrabble ranch near Glen Rose on July 31, achieved literary immortality with his 1960 nonfiction book, Goodbye to a River. Nationally distributed by New York publisher Alfred A. Knopf when its author was in the 40th of the 92 years he would live, Goodbye to a River is Graves’ account of a canoe trip with a dog he referred to only as his “passenger” (the dachshund’s name was Watty) down part of the Brazos River. John Graves on the Llano. 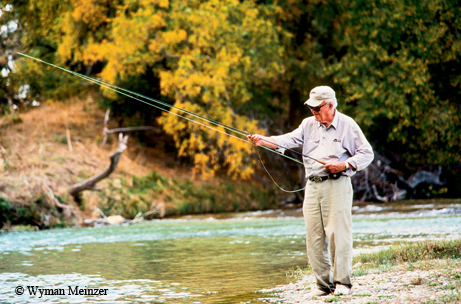 Born John Alexander Graves III on Aug. 6, 1920, in Fort Worth, where his father owned a clothing store, he developed a lifelong love for the outdoors. The first river that drew him was the West Fork of the Trinity, where he spent a lot of time as a boy fishing and hunting. 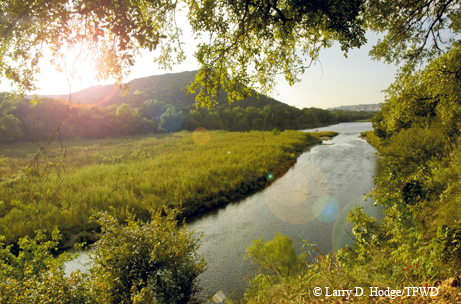 The next river that attracted young Graves was the Brazos, a wilder, more vigorous stream. When his family visited relatives in Cuero, he fished in the Guadalupe and hunted quail with his father’s brothers. Following high school, he went to Rice University. After graduating in 1942, the second-darkest year of World War II, he enlisted in the Marine Corps and served as a first lieutenant in the Pacific Theater. Fighting on the island of Saipan in 1944, he was almost killed when an enemy hand grenade was detonated by a Japanese soldier who had been playing dead. The young officer recovered from his wounds, but lost sight in his left eye and carried assorted small pieces of metal elsewhere in his body for the rest of his life. After the war, Graves spent some time in Mexico before moving to New York to get a master’s degree in English from Columbia University. Returning to Texas in 1948, he taught freshman English at the University of Texas at Austin for two years. After a short failed marriage, he went back to New York for a while before traveling abroad, spending most of his time in Spain. While in Europe he began writing magazine articles and finished a novel called A Speckled Horse that no one wanted to publish. Seeing himself as a future Ernest Hemingway-esque novelist, Graves threw himself into the expatriate lifestyle, but his sun never rose as that kind of writer. In 1957, Graves made what turned out to be an excellent career move and came home to Texas to help take care of his father, who had cancer. Not long after that, Graves got an assignment from Sports Illustrated (along with a $500 advance) to write an article about a canoe trip he planned to take down the Brazos below Possum Kingdom Dam. With a series of five dams planned for that section of the river downstream as far as Lake Whitney, Graves knew the stream would never be the same. He pushed his canvas canoe into the river on the afternoon of Nov. 11, 1957, and spent the next three weeks on the river, covering 170-plus miles. In camp each evening, he wrote his observations down in a notebook, eventually filling several of them. The trip proved to be as interesting and personally meaningful as he thought it would be, but his editor at Sports Illustrated didn’t agree. Even after Graves rewrote some passages and cut others, the editor turned it down. Graves at least got to keep the advance, which back then was major money. Not entirely daunted, Graves proceeded to turn the trip into a book that hit the stores in October 1960 in time for holiday sales. It gained immediate recognition as an important work, winning the top book award from the Texas Institute of Letters the following year. It was also in the running for a National Book Award. The dams proposed for the stretch of river he had written about never were built. The money Graves earned from Goodbye to a River eventually freed him from the teaching position at TCU he had held since 1958 and allowed him to buy 400 acres in the limestone hills of Somervell County southwest of Fort Worth, a worn-out farm he called Hard Scrabble. He cleared the land of as much invasive cedar as he could, built a house and moved to the property in 1970 with his wife, Jane, a former fashion designer for Neiman-Marcus, and their two daughters. Graves wrote only three other major books after Goodbye to a River, and all of those came more than a decade after publication of his first book. His second book was Hard Scrabble: Observations on a Piece of Land, a first-person account of his own, small part of Texas, the place where he would die. Published in 1974, Hard Scrabble, as its subtitle suggests, is a rumination on the land, from grasses and creeks to goats and hired hands. His next book was From a Limestone Ledge, a collection of essays published in 1980. Goodbye to a River and Graves’ second and third books have come to be known as the Brazos Trilogy. His fourth book was Myself and Strangers: A Memoir of Apprenticeship, published in 2004. He wrote seven other shorter books or anthologies, including The Water Hustlers (1971), Blue and Some Other Dogs (1981), A John Graves Reader (1996), The Last Running (1990), Texas Rivers (2002), Texas Hill Country (2003) and My Dogs and Guns (2007). While not weighing down library shelves with an extraordinarily long row of books, Graves continued to put interesting and well-ordered words on paper. He wrote for a variety of magazines, including the long-defunct Holiday, Esquire, Atlantic Monthly, Texas Monthly and Texas Parks & Wildlife magazine. Fittingly, six of the pieces Graves wrote for this magazine had to do with rivers: “The Canadian River” (March 1999), “The Pecos” (December 1999), “Life on the Llano” (Novem­ber 2000), “Riverfolk of the Neches” (May 2001), “Song of the Sabinal” (October 2001) and “Vein of History” (December 2001). Those articles became the book Texas Rivers, with photographs by Texas Parks & Wildlife contributing photographer Wyman Meinzer. While he praised Texas’ many fish-full manmade reservoirs, reading between the lines of what he had to say about rivers shows Graves still had reservations about building dams. Though he did have concerns, he ended his essay with an expression of optimism for the future of the Texas outdoors.